What happens when two seventies icons take on a cryptozoological wonder? It becomes the basis for yet another awesome Syfy monster movie. Airing tonight at 9 p.m. the plot of the Syfy original movie Bigfoot - starring former teen idols Barry Williams from The Brady Bunch and Danny Bonaduce of The Partridge Family - revolves around a conservationist and DJ who fight against each other before teaming up to fight against a really, really large Sasquatch. Then again, does the plot even matter in these fantastic films that are a cheese-and-ham sandwich of pop culture? Nope, we're tuning in for the intentionally B-level awesomeness with stunt casting. In this case, the stunt casting also includes Howard Hesseman (Head of the Class), Sherilyn Fenn (Twin Peaks), Andre Royo (The Wire) and shock rocker Alice Cooper (Dark Shadows). Even the director is inspired, since it's Oscar and Emmy nominee Bruce Davison (X-Men) - who starred in the Harry and the Hendersons TV show! 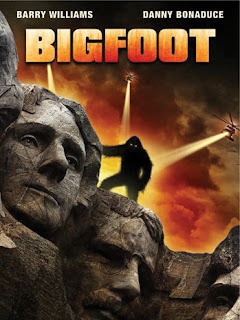 Along with Jersey Shore Shark Attack, Bigfoot ranks as one the more entertaining Syfy monster flicks, along with Sharktopus and Mega Python vs. Gatoroid. Q: So can you guys talk about how you became involved with this movie and what made you want to do it? Barry Williams: It was really easy for me. They said that they were talking to Danny Bonaduce and they wanted me in the movie. And I said as long as I can beat him up I’ll do the movie. Danny Bonaduce: Fair enough ... I was doing my radio show two years ago and heard that I was doing a movie about Bigfoot with Barry Williams. I called my agent who also has my name on Google Search and he said I just read that too. I said is there any truth to it? And he said I haven’t heard a word about it. And two years later we started production. It was really bizarre but it’s neat. Barry Williams: I have to tell you too, I love doing a monster movie. It’s great fun to do because it’s only scary when you watch it and not so much when you do it. I’m always interested in something where I have a chance to save the world. Danny Bonaduce: God I’ve got to disagree with Barry vehemently ... Scary movies are not that scary when you watch them but it was terrifying to make. I even asked Barry, I said, "Hey man, when that guy says look up here and scream because Bigfoot’s going to eat you and there’s no Bigfoot." You’re just staring off at a big stick with a piece of tape on it because we’re going to put in by magic ... I said, "Barry, do you like feel really stupid when we do that?" And Barry said, "No, I’m an actor. When he says Bigfoot’s right there I assume Bigfoot’s right there." And I went, "Wow, I’m bad at acting because I feel really stupid." Barry Williams: Well see, I paid a lot of money for acting lessons so I tried - I’ve spent my whole life trying to justify them. Danny Bonaduce: I was talking to a reporter. I said, "Barry Williams, I don’t know if you know this or not, but is a real live actor." ... Honest to goodness, you know, I have another occupation and this came along as a gift. I didn’t have to audition, I didn’t have to jump through hoops and that’s what a lot of actors have to do and one of the reasons I don’t really do it anymore. So I was more than pleased to do it. But Barry, God bless him, not only takes it very seriously but made it kind of easier on me to do because he’s really, really good at it. Barry Williams: Well Danny’s being very modest about his talents and what he brings to the table. But we did work together well. I’d do it again for sure. Q: Since both of you guys squared off in the boxing ring years ago, what type of appreciation do you have for each other now, at this age, doing a movie like this? Danny Bonaduce: I have the utmost respect for Barry from that particular boxing match because I box. I box regularly and I fight strangers and I go three rounds and see who can make it. And somebody had backed out of that fight with me and Barry took it at the last second. He’s a little bit bigger than I was so I tried to move around. And then finally he hit me and I thought - I mean he really hit me. It hurt. The guy that keeps getting back up, what’s the biggest scene in Cool Hand Luke? The guy who won’t stay down. George Kennedy, if I’m not mistaken, is not the star of that scene. It’s Paul Newman because he refuses to stay down. And I know this may sound like an overdramatization of a fight but until you’ve been in one, they’re pretty dramatic, that’s my impression of Barry Williams. I was yelling at him please stay down. I’m getting exorbitantly tired of this. So I have the utmost respect for Barry in any way, shape or form, not only as just as an actor. Barry Williams: I agree with you Danny - the boxing was the boxing. Danny and I have had a nice relationship, a respectful relationship for years and years and years. Boxing is boxing. It didn’t mean that we didn’t respect each other. I did not however know that he was not just a boxer but also a triple black belt. The producers left that part out. 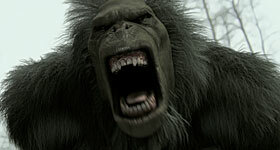 Q: Have either of you ever discussed Bigfoot before you were on this project?What’s your take on him? 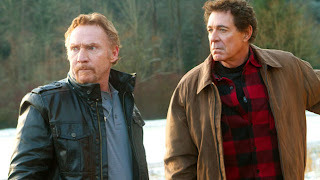 Danny Bonaduce: I just moved about eight months ago, and I do my new radio show - I guess I should publicize this as long as I have a chance - on KZOK 102.5 in Seattle ... Bigfoot is one of the main things about Seattle along with the rain and gray skies. In the airport is the Sasquatch Café. You can get your Bigfoot burgers and Bigfoot’s a thing up here that people talk about all the time. Now our Bigfoot in our movie is enormous. If there was something hiding that big I believe - and when I say this, immediately all of the techno nerds are going to go hey, "He’s one of us." It would give up a heat signature and we would find it. Do I believe that there is something? I don’t know if it’s necessarily out in the woods or under the sea or in the sky, but I believe for sure that there is something unlike us that has equal or superior intelligence. So whether it’s a Bigfoot or you’re using Bigfoot as an umbrella for aliens ... do I believe in stuff like that? Yeah, absolutely. Barry Williams: Well I certainly believe the Bigfoot in this movie ... If there is a real Bigfoot, just whatever his size, I hope he’s not as angry as our guy because our guy is not having it. He pretty much is cutting a swath, right down the town. Danny Bonaduce: And he’s really scary. Williams: Yeah, he is scary. And I’m not sure - he’s as big as King Kong. I mean this thing is fast, too. But I’m fascinated with theories and concepts. And like Danny was just saying, in Seattle it’s quite a big deal. The sightings, the trackings - I enjoy kind of observing it. And you have to know that somewhere in there there’s got to be some type of missing link or something that’s bridging the gap through our own evolution. But it’s hard to imagine with GPS taking it down to inches of where you are, that if we really wanted to find it, it would be pretty hard to hide. Q: You are two of our pop culture icons and there is yet another pop culture icon of ours in this film, Alice Cooper. Can you tell us about working with him? We were supposed to riff for almost two full minutes, I had said, "Come on, you have to help me out, Alice. We go way back." And he goes, "Go way back? I’ve known you for two hours and I already hate you." And he hit me with a riding crop. And I thought this is a really - this is an interesting way to delve into the world of improvisation with Alice Cooper who insists on hitting me. But I mean ... it’s super neat. Barry Williams: I knew we needed a pop icon in the role and Alice was not yet cast when we started the movie. And when I found out he was coming out and going to join us I was absolutely beside myself. Q: How meaningful to each of you was it that the other one is cast in this movie, which is to say would you have been just as satisfied to do it if the other actor had been say, Johnny Whitaker or Barry Livingston? Danny Bonaduce: Specifically, no. Because you’ve got to remember that Barry and I, we are a part of a club that, by the way, gets smaller as time passes. But it was a small club to begin with ... doing it with Barry Williams really meant something to me. Barry Williams: I can answer this. If it wasn’t Danny Bonaduce there was no movie ... First of all, I feel that way. But also Syfy itself told me, "Look, if Danny doesn’t do this, Barry, there’s no movie." Danny Bonaduce: If I had only known I was that important. Barry Williams: So it was a package deal and that’s the way it came down. And I think they had the right formula. Q: So what was your favorite monster movie growing up? Danny Bonaduce: I don’t know if you want to consider it a monster movie but as a disc jockey or a talk show host, I’ve moved into half a dozen cities or more and there are some things that you can just count on. And one of them is so what’s the scariest movie that’s ever been made, and your phone lines light up. Now, I usually have a fight between The Exorcist and Jaws. And, in my world, Jaws wins out because it’s now been 35 years, something like that, but I dive. And I will tell you there is not a time that I dive that at some point I don’t hear that (da da, da da) from Jaws. Barry Williams: Growing up, Frankenstein - the green one with the things coming out of his neck ... That was the one it would just stay with me after the movie was over and I’d be looking under the bed kind of thing. Q: So these creature features can range anywhere from really serious to really campy. How did you determine the right tone to play your characters? Danny Bonaduce: Most of the feeling for comedy is where to put your emphasis. And if the movie itself is supposed to be like tongue-in-cheek, then the only way to make it more funny would be to play it as straight as possible. Barry Williams: You’re exactly right. When you cast Danny Bonaduce and Barry Williams in the same movie - in a monster movie - you know it’s going to have some degree of camp to it. That’s why we’re picked. And so it’s going to have that certain tone. But the only way to play the movie is to play it for real, for keeps, and let the situations and the appearances - of Bigfoot and the circumstances, let them kind of play out. It’s all a little bit larger than life in that sense. Q: Syfy as a network has really owned the campy monster movie genre lately that harken back to the '50s. What do you think is the appeal of this new generation of campy monster movies now? Danny Bonaduce: I think one of the things is to go back to something you remember and secondly, something from your youth and something that was good. The juxtaposition of Greg Brady and Danny Partridge - they’re almost the yin and yang if you will. You grew up with one and, in a way - and I’ve heard this over the years - you kind of rooted for one or liked one better than the other. But the guy that had the guts to say it in a meeting: "Hey listen, I’ve got a great idea and we should do this for the foreseeable future - how about Debbie Gibson and Tiffany fight monsters and then have it work for them." I think the real strength came on pitching the idea. Once the idea came to fruition I think it’s an almost no brainer. I would absolutely watch Greg Brady and Danny Partridge fight it out over Bigfoot or anything else for that matter. As a matter of fact, I think they should do a whole series. Barry Williams: I wanted to add also partly from this question and the one just before it in terms of the campiness of it and approach to making the movie. If you play the movie to be campy - if you play it, then it just becomes corny. And that’s not really enjoyable to me. That’s not the kind of movie I would want to see. I do think it’s a way to be nicely entertained with a lot of action. There’s stuff going on from the get go. 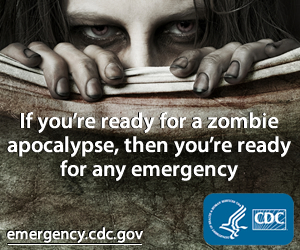 This is not the kind of a movie that waits until the last three minutes to show the monster. That guy is out and stepping on people like in the first 30 seconds. And then you’ve got helicopters and you’ve got hang gliders and you’ve got the Air Force and you have big guns and you have fights going on and you’ve got it’s just nonstop with action. So there’s something always going on to hold and pique your interest. While it doesn’t require a lot of over thinking. You’re on the ride and you go, like a roller coaster. Q: When people watch Bigfoot this weekend they’re obviously going to tune in because they know you from your previous roles. Is it sort of that curse, or is it a privilege, to be remembered - first and foremost - for an iconic role from when you were younger? Danny Bonaduce: It’s an absolute privilege. I can’t imagine that Barry feels too differently. But, you know, he’s got a show in Branson right now called Lunch with the Brady Bunch ... So I imagine he does embrace it. But here are the facts as far as I am concerned: That almost all of the good things that have come to me in my adult life have something to do with the fact that I was on The Partridge Family. I would not be - as Barry and I were both saying, it had to be Greg Brady versus Danny Partridge in this movie or there was going to be no movie. It’s funny, when I do interviews for things, and I do a lot of them, people almost seem afraid to ask the question. How can you possibly interview me without bringing up The Partridge Family? I can see because of some of the interviews that I’ve done with people who are mostly famous for one thing they did a long time ago, and they really resent it. I’m not one of them. I could not be more grateful for The Partridge Family and know the blessings that it has brought me. Barry Williams: Well I’m going to echo that. Typecasting works against you if it prevents you from getting jobs that you really want to do. I’m sure there are things that I’m not considered for because I’m known as kind of the good guy Greg from The Brady Bunch. But I’ve had a varied career that has included Broadway. I’ve been a DJ. I’ve written a book. I’ve produced movies. I’ve done every play I’ve wanted to do. I’ve got a great show that’s about The Brady Bunch. And I echo your sentiment, Danny. There’s a tremendous amount of privilege that comes with people both being familiar with you but in a kind way, and a way that makes them feel good - or as I was talking about earlier, sometimes takes them back into their own childhood when the whole world felt safer and more fun for them. So with anything there are there are two sides to everything. But overall, grateful would be the word I think that I would attach to my association with The Brady Bunch.